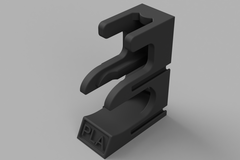 You can expand the size of your desk stand by just printing more parts and slotting them together with the dovetails. Print laying on its back, no support needed. I have included a bunch of different versions, some with the names of materials (PLA, ABS, CPE etc...) for those of you that want to use the print cores material specific, and i have also included some that just says AA or BB for the print core models.